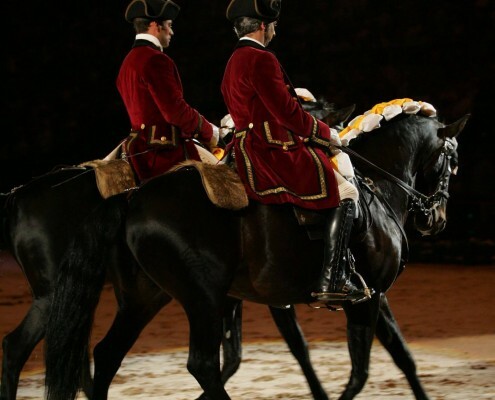 Nuno Cavaco is a former rider at the prestigious Portuguese School of Equestrian Art (EPAE). Where he worked for 25 years. 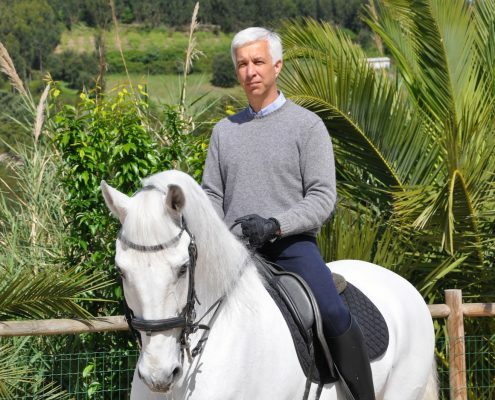 Today, he is a director in Lusitano Horse Finder and manages a variety of services – he gives clinics internationally, coaching students and competition riders in various riding disciplines and on all breeds of horses. 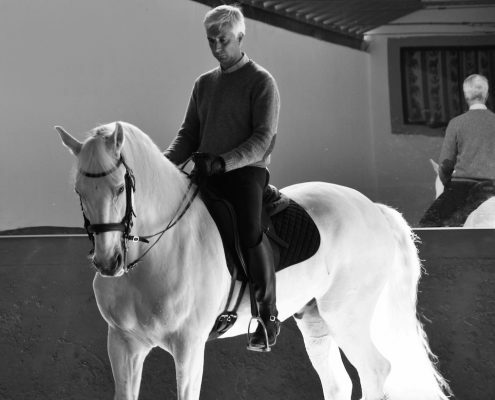 He has horses in training in Quinta da Marinha Cascais Portugal, where he provides a top service personally riding his clients horses he also gives dressage lessons. I met up with Nuno Cavaco in a quiet café during the annual Golegã fair, where he openly shared his equestrian history with us over a delicious coffee. 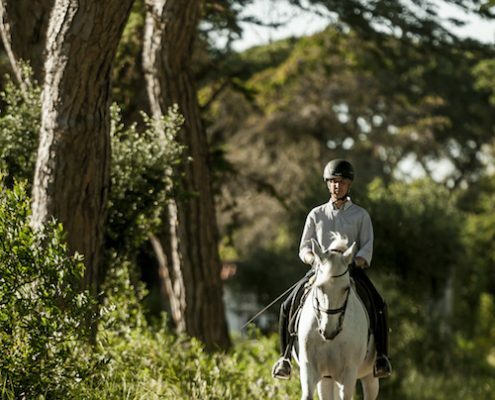 The talented young Nuno reached a stage where he was helping out by riding both private and lesson horses, he even represented the school in dressage and show jumping competitions. It was at Campo Grande that Nuno first came in contact with EPAE, (when the foundation re opened in 1979 they held their early training at Campo Grande}. Nuno reflected back “I remember that when I started to get to know the riders from EPAE, I was totally fascinated, I watched them training for hours. I learned a lot this way”. I still do love to see other talented riders there is so much one can learn by watching them work. I make a point of visiting classical masters whenever possible. Nuno – “The classical way of riding is the right way for me. Even though I competed as young lad, I was never really comfortable in the competition environment – where everyone is against each other”. 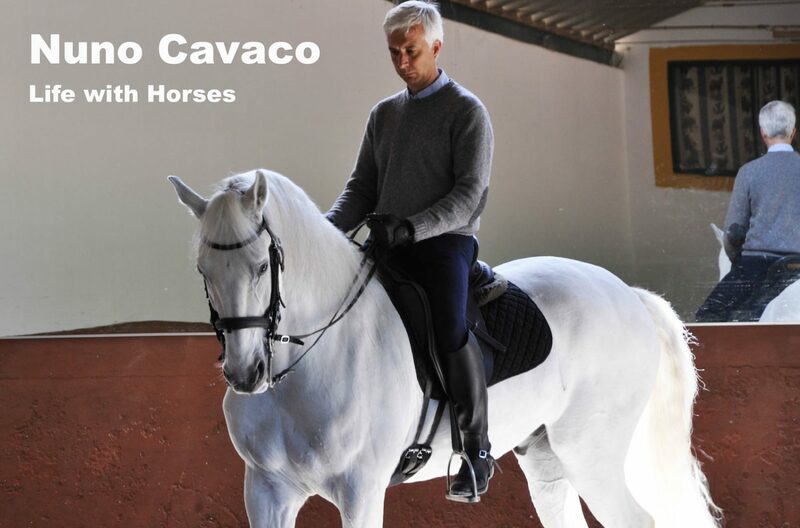 As a young adult Nuno Cavaco began his working career at the Jockey Club where met varies breeders and trainers giving him the opportunity learn and work with them. He helped with the breeding work and he started the young horses for riding. Nuno continues: “later I began working with Francisco Bessa de Carvalho for maybe two or three years I began to train some of the clients horses and also helped the clients with their riding. I discovered that I really enjoyed giving lessons. For me, seeing horse and rider progress positively together is something that makes me really happy”. 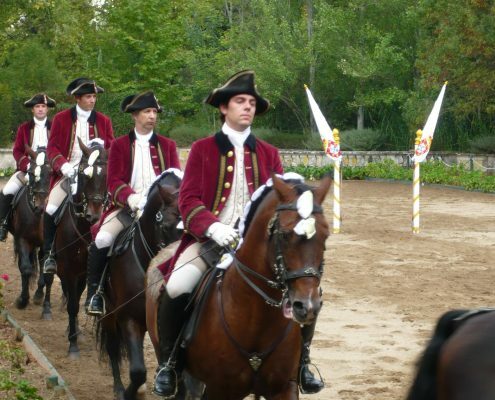 Dr. Guilherme Borba, D. José de Atayde, Dr. Filipe Graciosa, Mestre Luís Valenca and present day’s master chief riders João Pedro Rodrigues and António Borba Monteiro. Not to forget Nuno Palma Santos and Miguel Nuno Ralão. I was very lucky to travel a lot performing in many classical shows. 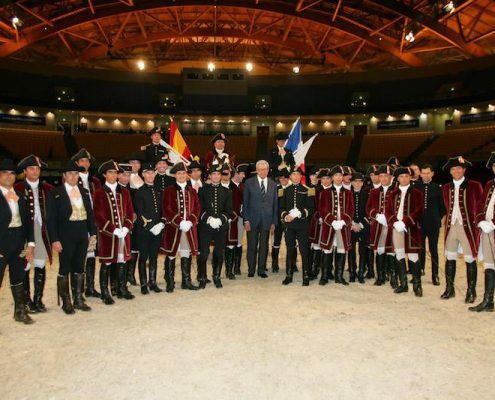 It was a very proud moment when I was personally invited to join by Mestre Luis Valença – to be one of two riders that represented the EPAE in Appassionata. “There have been many special horses in my life and I am sure there will be more. But to this day I’ve never had a horse of my own. Firstly when I was young despite my pleads my father never agreed to buy me one. Then later on I knew that if I had my own horse I would always want be with that horse and I would have to wait to the end of the day. With my work commitments it would mean my horse would always be the last one, so I never got one. But now, since I am no longer working at the school, I am, in fact thinking about looking for a horse just for me. I would love to have my own horse, I’m looking forward to it”. He also takes horses in for training and can train all levels up to all Grand Prix exercises. His work is sensitive and classical, horses develop beautifully without stress. He personally rides your horse and offers a quality service that ensures you are kept informed regularly about how your horse is doing through conversation, video, and photos. Nuno considers training starts in the stable and handling he often grooms the horses himself as he believes this is a vital way to know more about each horse. Find out more. Each horse in training with Nuno has a private passcode accessed online record that you can visit anytime and see everything about your horse from feeding, shoeing and training. Nuno has regularly taught Classical Dressage at clinics for us. He always makes sure that every client had a full hour of tuition and this, depending on the horse and rider, would include a mixture of lunge work, work in hand, Nuno riding and the client riding. 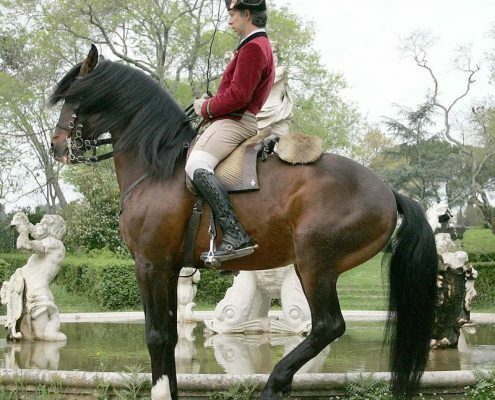 His intuition about the character and experience of both horse and rider is very evident and he works with them accordingly. He was always quiet with the horses, gaining their trust and drawing out their best work. The riders who only booked one lesson always wanted more! 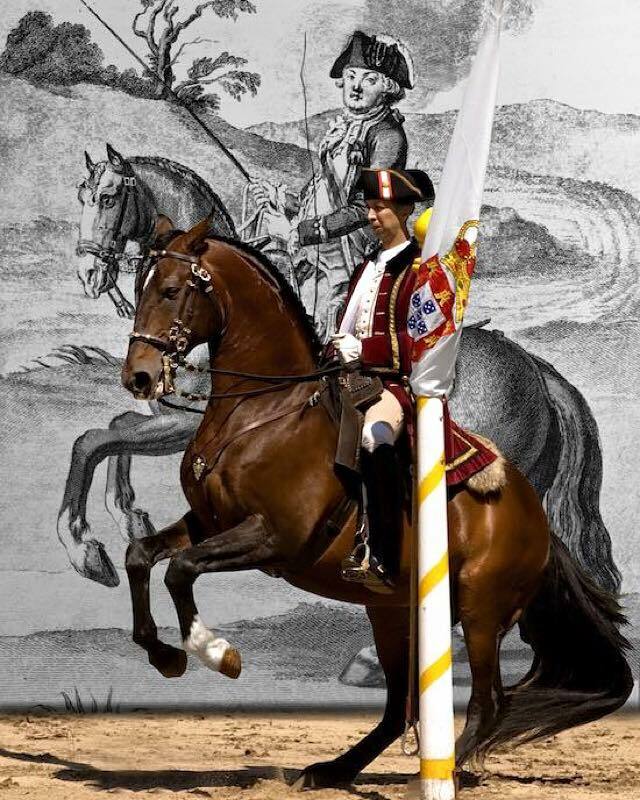 His attention to detail included changing tack if that helped the comfort and confidence of horse and rider. 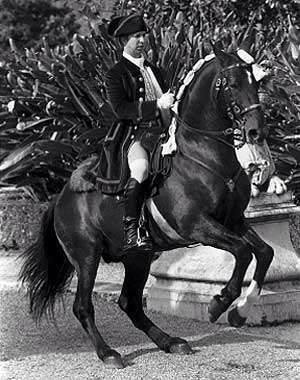 He was always happy to teach horses whatever their size, breed, age or experience and riders whether novice or advanced. The clinics were always great fun and very relaxed. 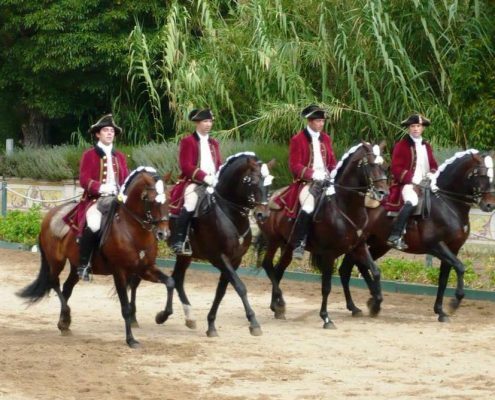 His 25 years with The Portuguese School of Equestrian Art enables riders to benefit from his obvious talent and wealth of experience.